Forget kale, broccoli, locavore-mania and the artisanal eats, and head to Coney Island on July 4th for the annual chow-down at Nathan's Famous Hot Dog Eating Contest. Here's where and when to celebrate the US Independence Day in Brooklyn in a way that combines that most American of all foods, the hot dog, with that most American of all styles—competition. 1. 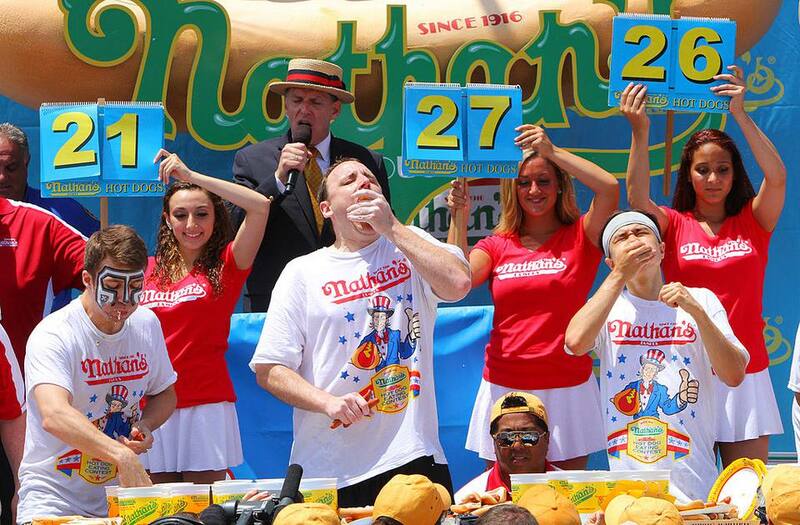 When is the Annual 4th of July Nathan's Famous Hot Dog Eating Contest? Well, when else would one hold a July 4th Hot Dog Eating Contest? Get there early, by 11 a.m. No tickets are needed. But you won't be the only one who wants to see the spectacle: in past years, 40,000 fans have come to the event, according to a company spokesperson. If you can't see the contestants, you can watch it on a Jumbotron screen. The annual gastronomic chow down takes place on the 4th of July each year in Coney Island, Brooklyn, New York. If you can't make it, the contest is live streamed on ESPN. Noon: Pre-show with live music and entertainment 10:00 a.m.
3. Where is Nathan's July 4th Hot Dog Eating Contest? If you want to join the gawking crowds as a select group of hot dog eating contestants stuff their mouths with Nathan's Famous hot dogs, then head to the corner of Surf and Stillwell Avenues in Coney Island, Brooklyn. Take the D, F, N or Q subways to the Stillwell Avenue terminal. 4. How many hot dogs do they eat? How many hot dogs can a human consume in ten minutes? The record is 70 hot dogs and buns in ten minutes. 5. What's the prize? The prize in 2017 was $10,000 in cash for both men and women winners, with over $40,000 in prizes. That ain't peanuts! 6. Can I show up and participate in this Coney Island Hot Dog Contest? No. The contestants are selected beforehand. Not everyone can join in and slow eaters need not apply! You have to be able to stuff a more than a few dozen dogs into your mouth in a period of ten minutes. (See above, How Many?). There are many qualifying events to get into this world renowned competition which attracts the top competitive eaters. 7. Is there a women's competition? Gender equality in all things hot dog! The answer is yes. The women's division began in 2011. 8. Who can eat that much, anyway? According to Nathan's Famous spokesperson, "Joey 'Jaws' Chestnut of San Jose, CA broke his own world world record for eating 72 Nathan’s Famous Hot Dogs and Buns in 10 minutes in 2017. New York's own Miki Sudo consumed 38 and a half hot dogs in 2016, which is a half more than she ate in 2015.